Discussion in 'Pontoon Forum' started by Bob & Sandi, Jan 31, 2019. Would like to say hello, new to the site. We ordered a new 20SSRX tritoon last Thursday at the Milwaukee show. We went to the boat show to look for ideas for the restoration of our old Sylvan and developed a moment of weakness. We have looked at Benningtons for the last 4 yrs. or so and while talking to a sales manager I got the look and we decided to pull the trigger instead, as to get a delivery date before Memorial day. Maybe, the ice will be off the lakes by then (Eagle River, WI. area). As we were at the show, we put money down and will meet Monday (Polar Vortex moved in) to go over the options since we hadn't looked over the options list in the sales brochure. A decision has been made to upgrade to a P. We are also going to added the Pillow Top 20% seating and the power bimmi top. I am also thinking of upgrading the stereo head to the KMC10. The boat is going to be black with firecracker accents. Going to go with the Yamaha 115 F series. We initially looked at the 20 SSRX, but now I am thinking of going with a 22SSRXP. My original thought was that I could use my old trailer(not) and it would fit the Shore Station (2600#, maybe). Now it looks like I am going to need a 3600#. The one thing I don't like about the 20 is the port side front seating doesn't look complete without the lounge seat back. As most of our cruising will be my wife, the dog and myself the 20 looked the way to go. If we do go with the 22 SSRXP I am also looking at adding the extended rear deck. The selling point for the rear deck extension is that I like the looks of the updated boarding ladder. Are the Kicker speaker grills white or are they silver? I have found Kicker speakers on line but the grills are only available in black and white. I will keep eveyone updated on the status and pictures once received. Any other thoughts or suggestions??? I found this great informative site Saturday after we had made our purchase. Mike31406, Spoiledrotten, Vikingstaff and 1 other person like this. Welcome ! Well you will learn on this Forum "The bigger the better" and we like to spend other peoples money, so be prepared! Was you Dealer at the boat show Shoreline Boat Center from Green Lake? We have a 2017 24SSRX Tritoon with a Yamaha 150 and we love the seating layout. I put my old lift on Craigslist and sold it and then purchased a used lift from a dealer by us. More members will chime in so stay tuned! You are on the right forum. Good Luck ! Mike31406 and SEMPERFI8387 like this. Welcome aboard. You can’t go wrong going bigger, nor getting extended deck. Well worth it. We got the GCW so we have that deck, but if it didn’t it was going to be a must have! Kickers should be silver. The KMC10 is great for streaming but has pretty poor fm reception. If you use satellite, see if they offer KMC20. You might look at the stainless ladder as it really cleans up the back end. Mike31406, ILLINOIS AVE, 1trotter and 1 other person like this. Welcome! I just bought a boat at the Louisville Boat show myself and can't wait. Illinois is right, this place loves to help you spend money! A lot of great reviews/thoughts on the best options here and extended deck is always mentioned. Everyone seems to love the SS ladder too. Welcome and enjoy! Mike31406 and Link like this. Exciting news Bob and Sandi! You're in for a real treat so be sure and post some pictures once you take command. Congrats on the new boat. We picked up a 21SSRCX last fall with the 115and love it. Mine does not have the passenger captain seat like I think your model has, and wish we would have gotten that. That’s the main thing I’d do different. Other than that, I’d recommend the underwave shield and the extended aft deck as must haves (which don’t blow the budget). The 21 is plenty of room for us our kids, dogs, and friends, but is mostly my wife and I and dog that are cruising (and the 20 would have been good for us too). The 115 is good for cruising, (and has decent speed when not loaded), which is what we do with ours. If you want to do a lot of water sport towing of adults, with several folks on board, you may want a larger engine. I also plan to troll with it the 115, as I don’t want to mount another motor, and the 115 is a tiny bit fast for that, but can be slow enough to do the job, and I think the bigger fish will be able to keep up just fine. CapKaz, Michiman and Stevez like this. Congratulations on your new Bennington and welcome to the forum. This is a great place to have youquestions answered. In my opinion the extended aft deck is a must have makes boarding, putting on the cover, water sports etc. soo much easier. You are going to have a great summer. Thanks for the warm welcome to the club. Tomorrow is the day we spend the money. Darn that Christmas wish catalog. Looks like there are going to be a few (bunch) of additions. SEMPERFI8387, Vikingstaff and Stevez like this. Finalized the order of the new boat last Monday. We ended upgrading to a 22 SSRXP with a 115 Yamaha. Look's like I am going to have to purchase new trailer and a different boat lift, the 2600 lb Shore Station and 18-20 ft trailer just won't cut it. I might be able to get the boat to water level but that would be it. 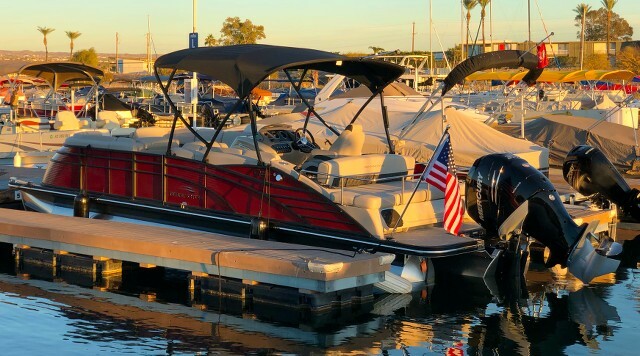 At the show, it was to get the money down to get a build spot for the boat to be delivered before Memorial Day, then it was the end of April, and now it sounds like the boat will be delivered before Memorial Day. We will just have to wait and see when so we are going to have to kill time until then, so now it is snowmobiling time to kill the remainder of the winter, about 12 inches last Thursday and then another 12 on Tuesday and it is only the middle of February. Look's like we won't be needing the boat till at least Memorial day unless we take a trip to Florida for some test runs. Jim Rampello, Michiman, SEMPERFI8387 and 1 other person like this. There's something wrong with your pictures. I see white all over the place. Maybe they're overexposed? Congratulations on the new boat! It will be a long couple of months waiting for it. I'm jealous about the power bimini top! SEMPERFI8387, Vikingstaff, lakeliving and 1 other person like this. Congratulations! Sounds like a great build. And Mike, there isn't just white all over the place. Looks like A LOT of white all over the place. MikeOnTheLake: The power bimini comes from an ooooops with our current Sylvan. Came up on a bridge and not thinking, looked up and said "OH schmit", hit reverse, but it was to late. At least it was a slow no wake. You can figure the rest. Now it is going to be, hopefully, a non issue. Gotta ask Bob, what do you ride in the winter? We snowmobile in the northern L.P. of Michigan ourselves. A Ski-Doo family ourselves, but some of my extended family leans towards Cats and Polaris’. Why didn't you get at least a 150? Are you sure you got ESP? That not a normal option on the SX and with only a 115 I'd bet it's never been done before because you wouldn't have enough power to realize it's benefits. Alicedream, lakeliving and cwag911 like this. Actually the dealer talked me out of a 150, said the 115 would be more than enough. I do think the 150 (MORE POWER) would have a better resale value if we ever decided to part with the boat. We are coming from 25 hp boat so anything larger is a plus. This boat, for us, is a cruiser as it is normally my wife, myself and the dog (Alaskan Malamute) so a 115 will get us where we want to go. I normally know the weather before we leave and keep an eye on the sky while we are out just in case something were to pop up. Normal running is the Three Lakes/Eagle River chain of lakes in northern Wisconsin. I can normally run all day and only see the same water twice. Now that we are retired we might take some day trips to some of the larger lakes in the middle part of the state so maybe a larger engine might be better; but then we can always put in in different location, on a different day, and over lap the last trip. We don't have the large bodies of water that you see down south. Its going to be easy to do day trips an the way up North, just stop, drop in, run for a while, and then head up. I am going to have to look but I think that what was ordered was the EPP package. If I have the need for speed, I have a 19 ft. jet boat that will run low 80 mph( 500 cu in HEMI). We ride Doo's, use to run Polaris. Bought 2 900 Enduros last year, our first Doo's, love the 4 stroke and the air ride. Love the sleds, even change my colors back to the Norther Lichen from 2016/17. We only rode twice last year do to family issues and lack of snow at the end of the year. It was to bad we couldn't run in April as we had a weekend with 15 inches of snow. Rode once back in January as the snow at Christmas was poor at best. Went out today, snow was good, some trails good, some bad due to to much snow and lack of grooming (moguls and big holes). The lakes were OK, lots of moguls, and lots of heavy snow due to lack of traffic. Trails could use a couple days of good grooming. Would like to get up to the UP to ride again. Have nice trailer but I don't want to ruin the truck(salt) we currently have. I am looking for something used, in good shape, to to do day trips. I would like to get up to the Hurley area again but at the end of the day still have to be back in about 8 hours for the dog. I figure we can ride to Iron River to Watersmeet and back in about 8 hours. Haven't made that trip since about 2003. Hoping to get out to Wyoming and Idaho in the next few year to trail ride, also do the Black Hills. I have watched all of the Youtube videos. Also I am going to work on getting into Yellowstone with our sleds. There was a member on DooTalks that did the trip to Yellowstone 2 years ago, posted pictures) and at that time I said I want to make the same trip. Sorry for being long winded, again. DaveyJ, Swingback, Vikingstaff and 5 others like this.